Chloramine-T can be used as a disinfectant to control bacteria, molds, yeasts and viruses. In the Netherlands, Chloramine-T is allowed only in powder form under the trademark Halamid and Halamid-d.
Abroad, Chloramine-T in tablet form is widely used for disinfection of drinking water during and after emergency situations such as natural disasters, wars and outbreaks of infectious diseases, but also under normal conditions in the drinking water supply of residential areas. 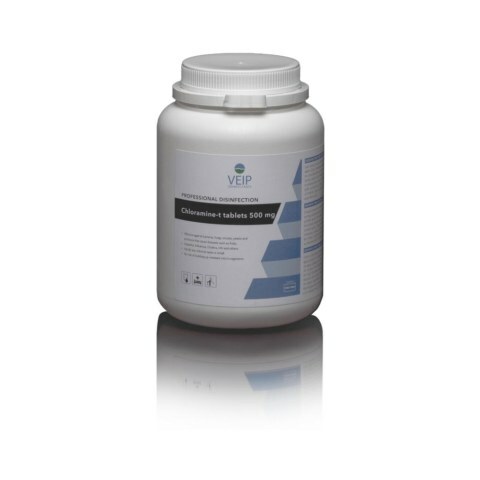 Chloramine-T is very effective against pathogenic bacteria, viruses and prevents resistance of microorganisms. It virtually has no taste when added to the drinking water and is mild for water-pipes and water-tanks. Use biocides safely. Before use, read the label and product information. Standard available (outside the Netherlands) in tablet form (20, 500, 1000 and 2500 mg).